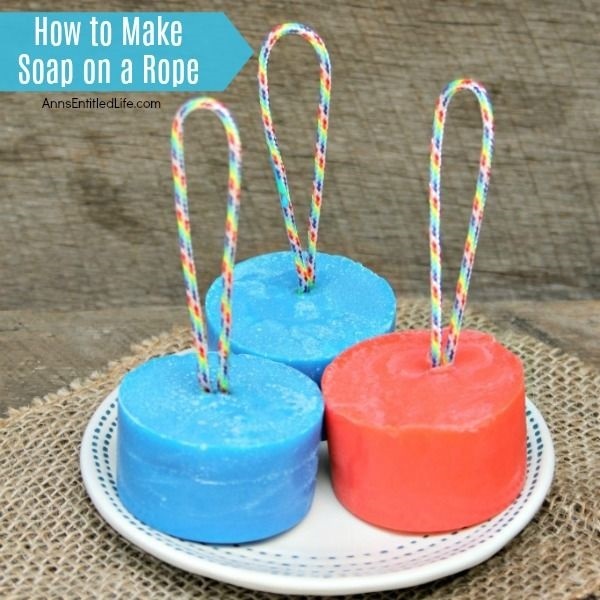 This wonderful step by step tutorial on how to make soap on a rope will have you making your own soaps on a rope fast! 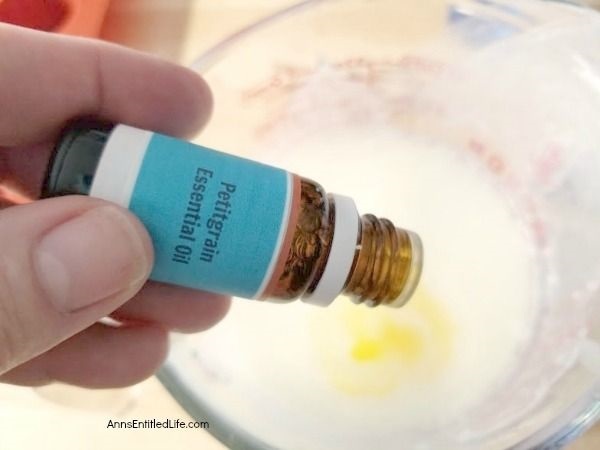 Make with essential oils, this homemade soap recipe is highly customizable in looks and scent. 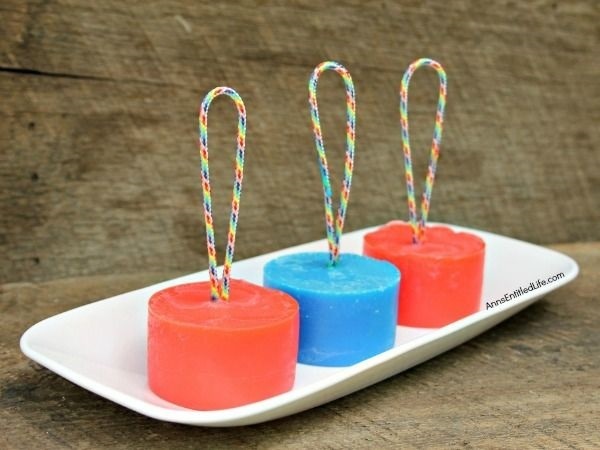 These homemade essential oil soaps on a rope make for great gifts, fun favors for showers, or are perfect in the guest bathroom. Make some today. 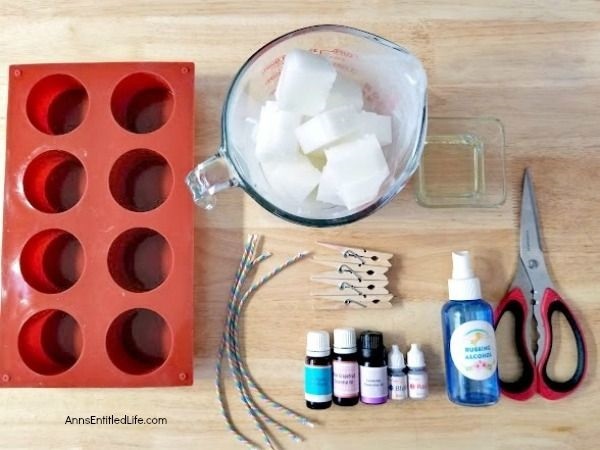 • This is the Soap Mold used in this tutorial. 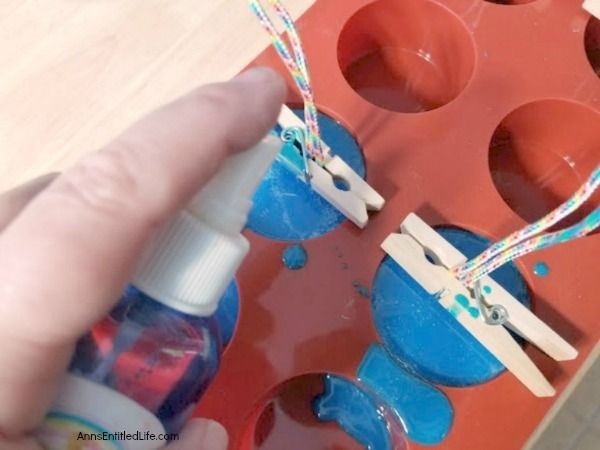 It works very well but any soap mold tall enough to give room for the rope will work. 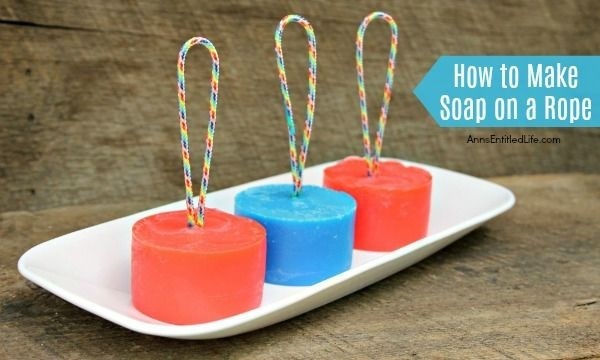 • I list paracord or cotton rope as the rope portion of this soap on a rope. paracord is the superior product as it does not fray as easily as cotton rope. The colors will not run into your lighter colored soaps. 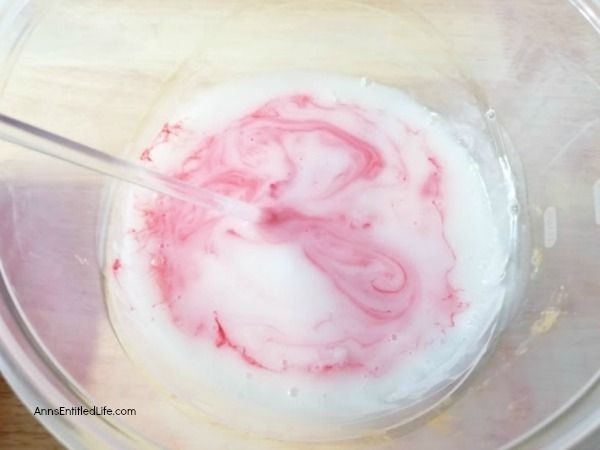 • Be sure to use soap colorant (soap dye) and not food coloring when making soaps. 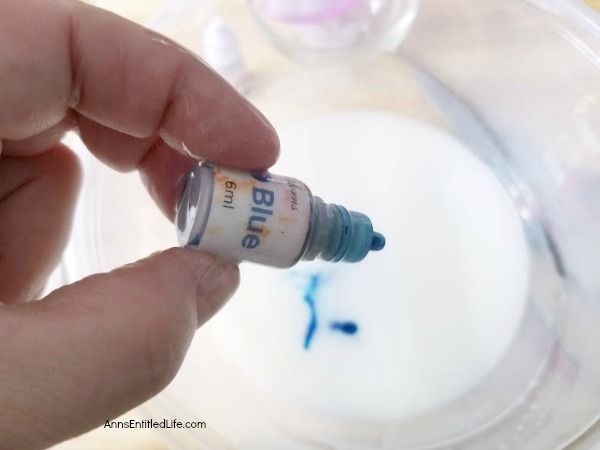 • You can add more or less soap dye to make the colors deeper or pale. 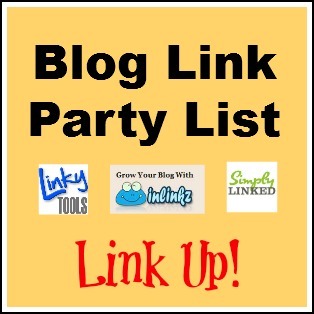 • You can add more essential oils for a stronger scent. 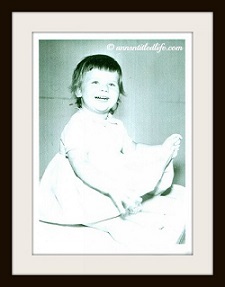 • Tip: I like to allow my soap to harden so I keep them unwrapped on a shelf in the linen closet. The closet smells pretty good too! The scent will dissipate this way, so add more essential oil if you plan to store your soap open on wire racks (shelving). • 2-3 feet Paracord or Cotton Rope. 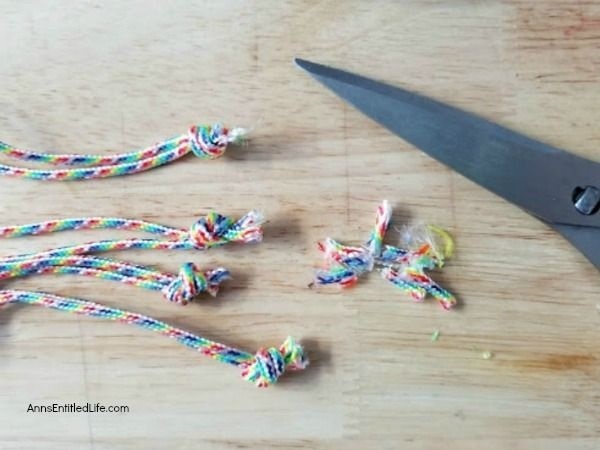 Step 1: Measure, cut, knot and trim your paracord. 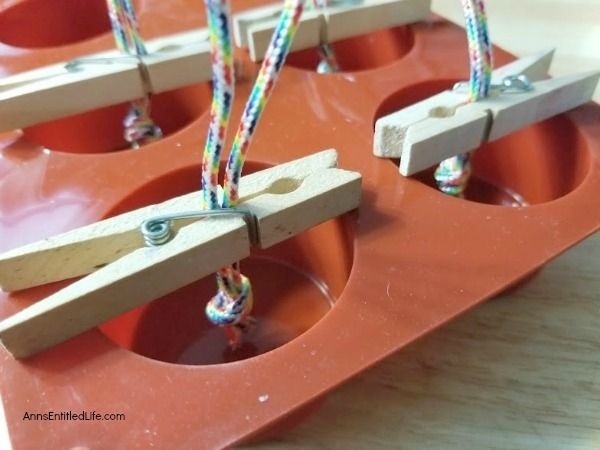 You should have about a ¼ inch of room from the bottom of the mold and the amount of cording you want to show form the top is totally up to you. 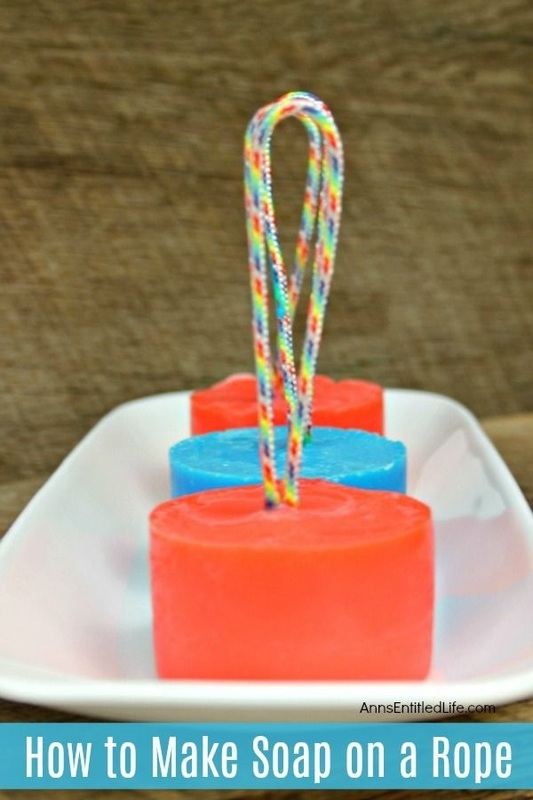 For the mold used in this tutorial, paracord was cut into 8″ pieces which allowed room for the knot, room at the bottom and about 3” of cord showing from the top of the soap. 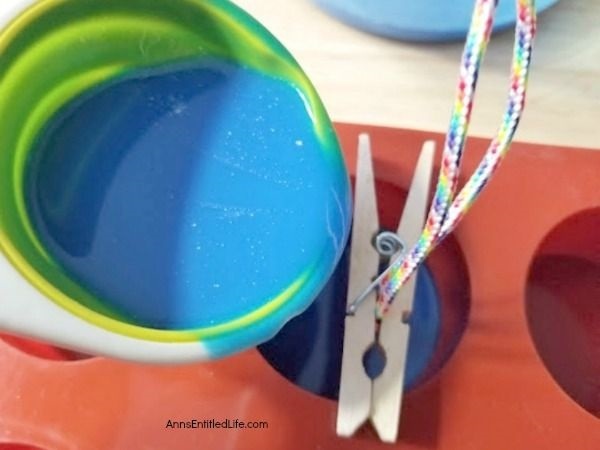 Step 2: Place each piece of cording in mold and secure in your clothespin. 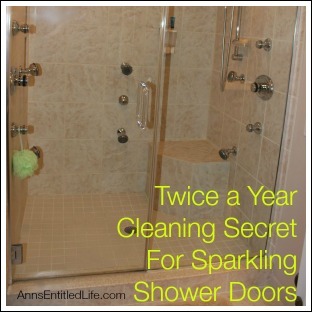 This will keep the cording in place when you pour the soap and while it hardens. 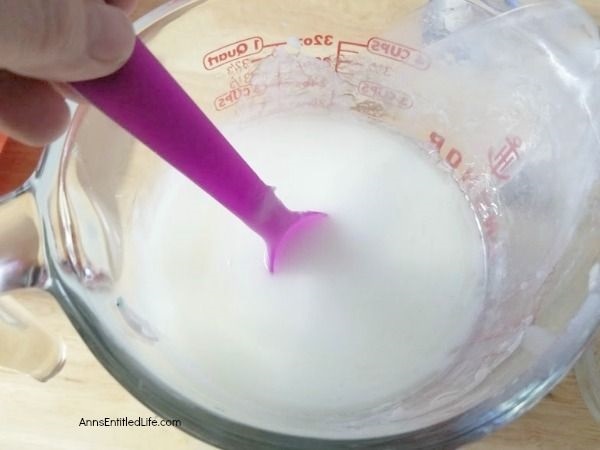 Steps 3-4: Melt soap base in a microwave for 30 seconds. Stir and repeat until completely melted. Add coconut oil. Steps 8: Mix everything together. 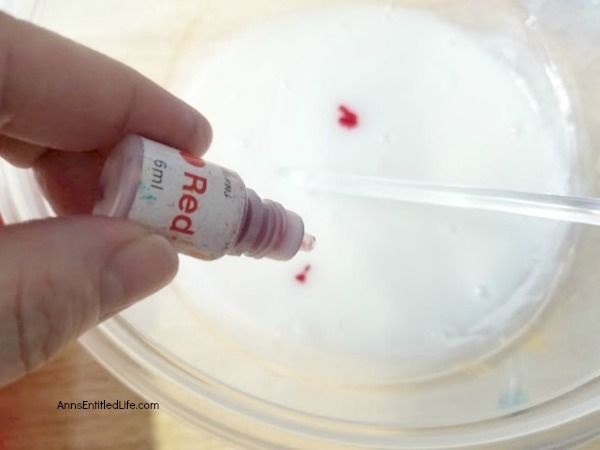 Steps 9-10: Add Soap Coloring and mix until coloring is well incorporated. 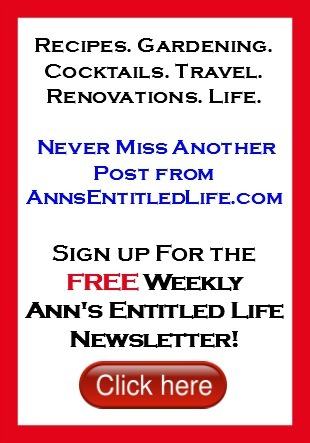 Add as much or as little as you like in the colors of your choice. Generally, the more color added the deeper the color. 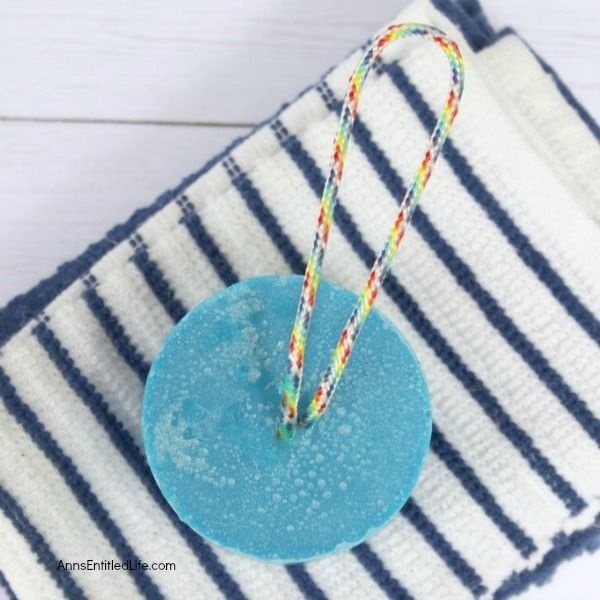 Step 11-12: Carefully pour the soap mixture into a soap mold and spray rubbing alcohol to get rid of any air bubbles. Steps 13-14: If using a second color, repeat steps 9-10 above. Steps 15-17: Repeat steps 11-12. Allow to harden overnight. Remove carefully and store in an airtight container or Ziploc bag unless you want your soap to harden in the open air (see my tip above). Please remember that none of this is meant as medical advice. 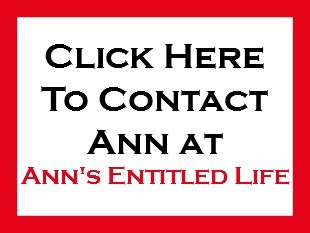 I am not a doctor and do not play one on the internet. 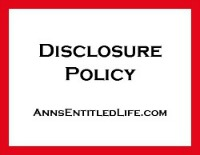 Please consult a physician if you have any questions about using essential oils or making soap so your doctor can better explain to you the benefits, possible side effects, and any warnings about essential oils or soapmaking. 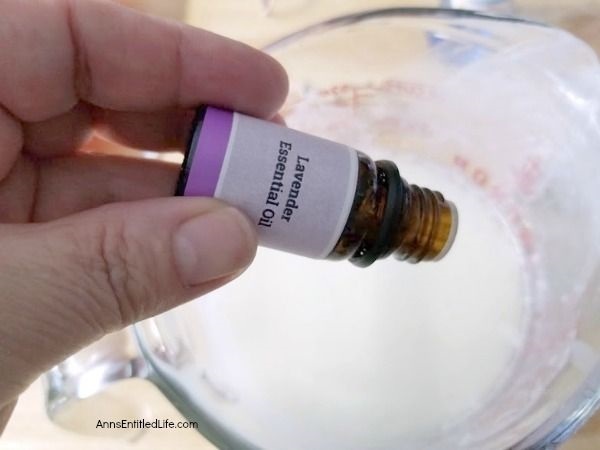 • Lavender and Oats Goat Milk Soap Recipe – This soothing recipe of luxurious goats milk, hydrating shea butter and exfoliating oatmeal smells fantastic and feels great on your skin. • DIY Lemon Poppy Seed Soap: Homemade Soap Recipe – Making your own soap is fast, fun and easy. This lemon poppyseed soap recipe is easy enough for soap making beginners. If you are looking for a new and unusual soap recipe to make at home, this lemon poppyseed soap recipe is it! 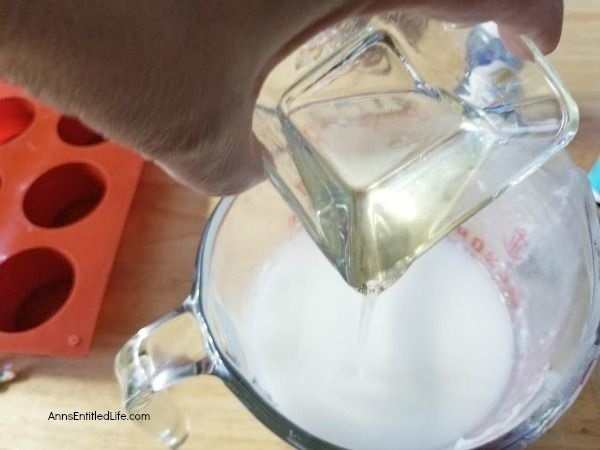 • Make Your Own Orange Creamsicle Soap – Making your own soap is fast, fun and easy. 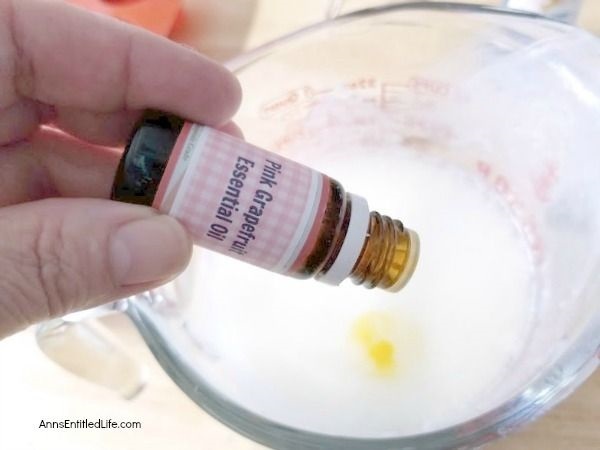 This terrific recipe for Orange Creamsicle Soap smells fantastic and feels wonderful on your skin. 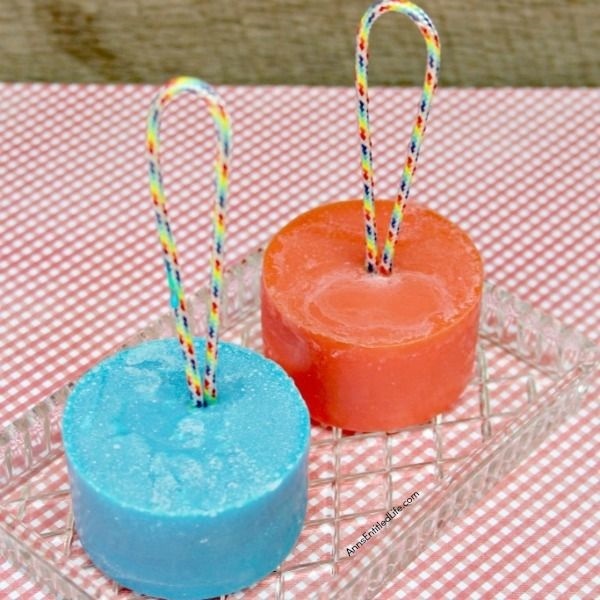 If you enjoy a zesty citrus scent, follow these easy tutorial instructions to learn how to make Orange Creamsicle Soap!